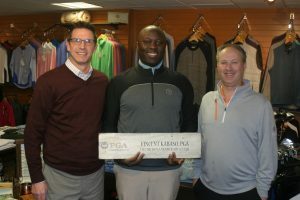 The Philadelphia Section PGA is celebrating one of its newest and truly trailblazing members, Vincent Kabaso, who hails from the country of Zambia on the continent of Africa. Kabaso, a PGA Professional at Talamore Country Club in Ambler, PA, is the first among a population of 17 million people to earn membership in the PGA of America. Kabaso, who grew up in a small Zambia mining town called Luanshya that didn’t offer much activity for youngsters, was lucky to have one of the country’s few golf courses nearby which allowed him to learn the game. “We didn’t really have any after school activities so, prior to golf, I was shooting birds and mice with catapults or swimming in a nearby snake and disease infested stream,” said Kabaso. In 2004, after graduating high school, and spending a few years playing locally while working at a golf course, Kabaso earned a grant from the prestigious Royal and Ancient Golf Club of St. Andrews that enabled him to attend college in England for a year. He then earned another grant that allowed him to study professional golf and sports science in St. Andrews, Scotland. Backed by his newfound golf education, Kabaso returned to Zambia and started managing a golf course, while also operating a first-of-its-kind junior golf academy. As he continued to hone his teaching skills, Kabaso travelled with the Zambia national team to several continental events serving as a coach and mentor to younger players. Seeking to take his golf business expertise to another level and realizing that no one from Zambia had ever received formal PGA training, Kabaso moved to the United States in 2013 to enroll in the PGA Golf Management University Program at Methodist University, his first step to attaining PGA of America membership, at the age of 26. While unforeseen circumstances forced Kabaso to eventually leave the program, he was undeterred and soon followed the PGA Associate path, which resulted in his securing an assistant golf professional position at New Haven Country Club (Connecticut) in July of 2014. This allowed him to re-enter the PGA program and in April of 2018, after completing all of his educational requirements, Kabaso became the first Zambian ever elected to PGA Membership. Over the next few years, he continued his role at New Haven CC, while also working for two years at Srixon Golf, before finally arriving at Talamore Country Club, where he now proudly serves as a PGA Golf Professional on the staff. In addition to his duties at Talamore, Kabaso is an accomplished motivational speaker and an author of a soon-to-be published book titled: How The World Raised Me – my path to becoming Zambia’s first Class A – PGA Golf Professional. Kabaso also remains committed to his own game and continues to compete in Philadelphia PGA Section tournaments with hopes of someday qualifying for a professional event to play alongside the PGA Tour’s best players. He is also a devout family man, as he and wife Hannah are the proud parents of a baby daughter, JoAnna Zawadi. While Kabaso relishes his career and adores his new family in America, he often misses his family back in Zambia, including his mom, dad, two brothers and five sisters. He also maintains an unwavering dedication to paying it forward and inspiring young golfers in Zambia to follow their dreams. Working with the Zambian Golf Union, Kabaso established the Albert Kabaso Invitational tournament, which helps preserve some local golf traditions and supports the local community. Further, he created the “Raised By the World” Foundation, which connects University of Zambia Students to local community organizations and schools, while inspiring and helping kids develop goals and aspirations. The foundation also supports junior golfers and includes a collection of used golf equipment that he compiles in the USA and sends back to Zambia. The Philadelphia Section PGA (PPGA) is one of 41 geographical sections of The PGA of America. Composed of PGA Professionals who serve as the “Experts in the Game & Business of Golf,” the PPGA encompasses Eastern Pennsylvania, New Jersey (Trenton – south), Delaware and parts of Northern Maryland. Since the 1920s, the PPGA has been the voice and face of golf throughout the region backed by over 850 PGA Professionals and Apprentices who promote the enjoyment and involvement in the game of golf, and who are at the forefront of programming/events at more than 300 public and private golf facilities, including some of the country’s most acclaimed golf courses. PPGA members collectively impact over 2 million rounds of golf annually, encompassing over 100,000 club members, hundreds of thousands of public course golfers, business leaders and one of the country’s strongest stable of junior golfers. The PPGA is further complemented by its charitable arm, the Philadelphia Foundation, which was created to positively impact lives and communities through the game of golf. For more information about the Philadelphia Section PGA, visit www.philadelphia.pga.com.